My Science March sign, using the same technique/materials. I woke up the day before the Women’s March and felt a need to make a sign. I’d never done this before though, and the online resources I immediately found were pretty vague: “attach handle”, for instance. The whole reason I was googling was to find out what makes a good handle, guys! Also, the forecast for Portland was rain. Loads of rain. (You can tell photos of our Women’s March from others by the high incidence of umbrellas!) So, I set out to make a rain-proof protest sign, and my improvised solution worked very well. 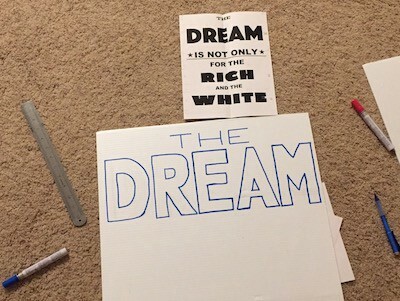 Many marchers asked about my materials, so I thought I’d share my process. 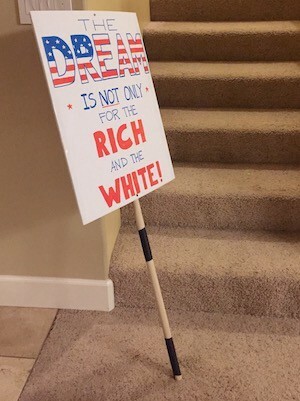 My sign went completely undamaged by the torrential rain, and is so sturdy it is ready for another march (or three, or a dozen, whatever it takes) at a moment’s notice. The other side of this sign is more serious. Like a mullet: business in front, party in the back. This uses plastic, bought for the purpose. If you want a biodegradable or recycled sign, this is not your huckleberry. I recommend choosing a slogan you’re going to want to use multiple times. You can also flip the plastic pieces to the other side to repurpose the sign, or I suppose attach a changeable paper sign to this sturdy plastic one. Some jurisdictions apparently ban the use of wood supports on signs, and some protests ask that participants not include sticks. I’ll update this with a link if I find a roundup of local laws, but check your jurisdiction and your protest’s guidelines to make sure this sign is allowed. 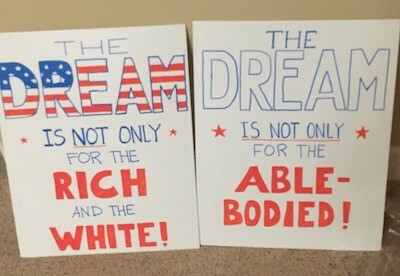 Alternatives: If you don’t have a power drill, you could punch holes in your plastic signs and cable-tie them tightly to the dowel, or use a staple gun powerful enough to staple into the wood. Plastic blanks — I got these in the hardware section of my local superstore, in a display with ‘garage sale’ and ‘for sale by owner’ signs. Hardware/home supply stores seem a good bet. Online — You can also search for ‘corrugated plastic sign blank’ on Amazon, though many of their options are large packs (say, of 25) you might share with friends. 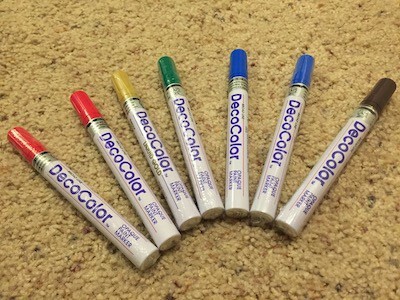 DecoColor paint markers — At least here in Oregon, paint markers have to be locked up so taggers won’t shoplift them, and only art supply stores generally want to deal with that headache. Some very nice employees at my local Blick’s Art Materials helped me test different brands of paint markers for how well they stick on plastic and stand up to water. Sharpie oil-based and Krink paint markers are water-resistant, but DecoColors are, as advertised, seriously weatherproof. Online — They are much cheaper from Blick’s than from Amazon. Scroll down for all the colors. You want broad tips, and will wish they were even broader. 1" dowel: Same hardware section, in the paint aisle. The 48" length was perfect for a 24"-tall sign. 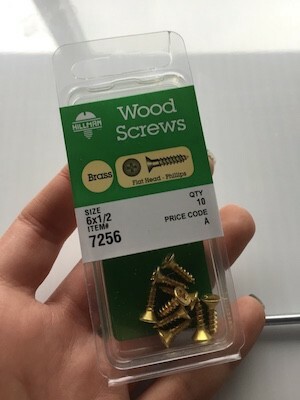 Mine was labeled simply ‘hardwood’, and it didn’t split around the screws at all. Online: Home stores have them too. Wood screws, gaffer tape, etc. are all available in hardware stores or hardware sections. Drawing my sign with my mockup handy. 1. Draw your signs in a well ventilated space. These pens do stink! Two signs, done. I didn’t fill in the pattern on the second ‘dream’ because it was late already! 2. Attach your signs to your dowel. Use eye protection, and stagger the screws on either side of the dowel so they aren’t in any danger of meeting or splitting the rod. First, immobilize your dowel and drill a guide hole (I used the smallest bit handy, 1/16 inch) through sign and dowel both. Then swap out the bit and drive the screw through both. I put one screw toward the top and one toward the bottom. Flip the sign and repeat. 3. Tape the sides of the signs together with your clear packing tape. This makes them less likely to snag on your fellow marchers or yourself, a little more aerodynamic when it’s windy, and just generally sturdier. 4. Gaffer-tape the handle if desired. My dowel seemed well sanded, but the cloth of gaffer tape is just more pleasant to hold onto, and gave a great grip for my textured gloves (which I recommend wearing, especially in Oregon in winter.) The two spots I randomly chose ended up being great places for a two-handed hold, though of course I held and waved it plenty of ways. Now you have a protest sign sturdy enough to last you a lot of marches, so you can be equipped at a moment’s appalled notice. May the Force be with you. TL;DR: DecoColor Opaque Marker Pens are seriously waterproof and work on plastic corrugated signs you can find at the hardware store. 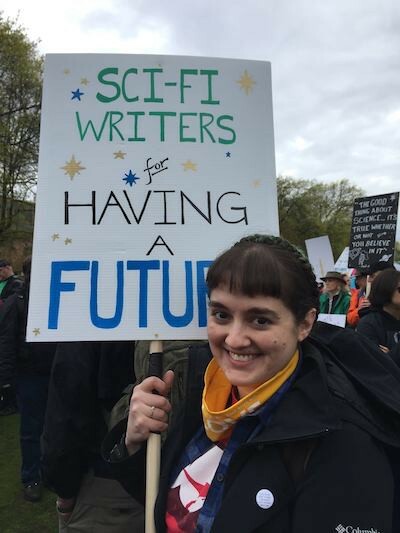 Nebula-nominated spec-fic author, eclectic reader, myth collector, piemaker & dinosaur enthusiast. My stories have appeared in Asimov's & elsewhere.